Paisano Publications Blog – Page 124 – Up to the minute ScuttleButt from your pals at Easyriders. If it’s of interest to bikers, we’ll post it here! Michael Ballard’s Full Throttle Saloon, a Sturgis, South Dakota, landmark was destroyed in an overnight fire on Tuesday, September 8. “The World’s Biggest Biker Bar” was made world famous when TruTV serialized the goings on behind the scenes of the establishment for a multi-season TV show, featuring Michael and his wife Angie. The couple was visiting family in Tennessee when they received word of the fire. Fortunately no one was hurt in the blaze, which was fought by the Sturgis Volunteer Fire Department, as well as fire departments from several nearby towns. The cause of the inferno is under investigation, and KOTA Territory News is reporting that a special ATF team has been called in to lend their expertise to the probe. The loss has been estimated at $10 million. STURGIS, SD — The National Response Team (NRT) from the Bureau of Alcohol, Tobacco, Firearms and Explosives (ATF), along with agents from the ATF St. Paul Field Division, the South Dakota State Fire Marshal’s Office, the South Dakota Division of Criminal Investigation, the Meade County Sheriff’s Office and the Sturgis Police Department have completed the investigation into the cause of the September 8th fire at the Full Throttle Saloon located at 12997 South Dakota Highway 34, Sturgis, SD. The cause of the fire was ruled to be accidental, announced South Dakota State Fire Marshal Director Paul Merriman and ATF St. Paul Field Division Special Agent in Charge James Modzelewski. Investigators can say conclusively that the fire originated in the main part of the bar and has been determined to be accidental in nature. SAC Modzelewski said, “The ATF National Response Team and our investigative partners have completed their assignments at the fire scene. Over the past five days investigators have taken countless photographs, inspected and examined artifacts recovered from the scene and conducted numerous interviews. The information developed was reviewed and analyzed to assist in determining the cause of the fire.” The ATF National Response Team departed Sturgis today. Damage is estimated at approximately $10 million. ATF’s NRT, comprised of ATF personnel from across the country, responded to the scene to work alongside state and local investigators. The NRT includes a canine team, certified fire investigators, forensic chemist, electrical and fire protection engineers, and additional specialists. This NRT activation was the 15th this fiscal year and the 773rd since the team was created. More information on ATF and the NRT can be found at http://www.atf.gov. 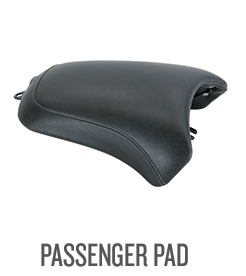 Press Release: With our FL Solo Seat and Passenger pad we’ve done all we could to create a seamless blend of the two parts. No matter if you’re rolling solo or two up, you’re looking good doing it. Rather than disrupting the lines of the HD Bagger, we worked meticulously to set the hand shaped solo seats so they are as comfortable as they are stylish. With our Bagger Pillion the goal was to build a removable passenger pad that looked as good as the solo unit. Our pillion flows with the lines of our solo seat and turns it into what would normally be a stylish 2 up seat, but with the bonus of being able to remove it when your rolling solo. 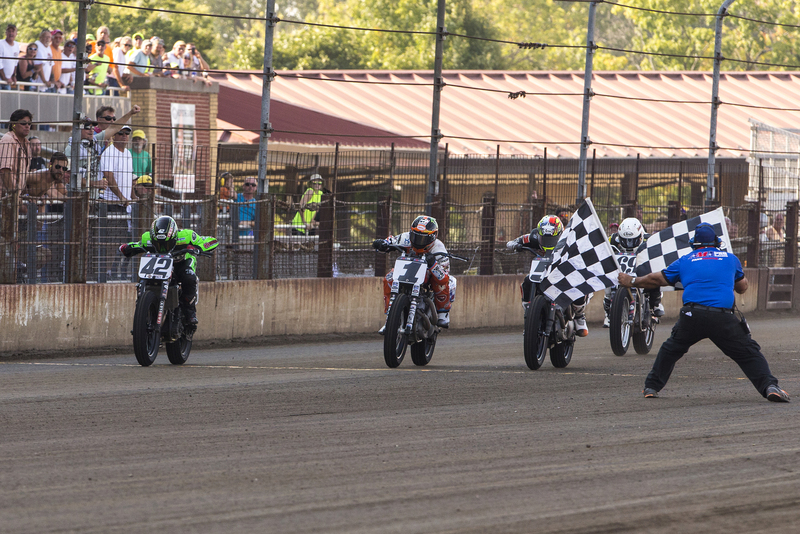 Springfield, Ill. (September 6, 2015) Harley-Davidson Screamin’ Eagle Wrecking Crew rider Jared Mees finished second in a thrilling race on the Springfield Mile and in doing so keeps a grip on the season points lead in the AMA Pro Harley-Davidson GNC1 presented by Vance & Hines flat track series. Mees, the defending GNC1 champion, holds a one-point lead with three races left in the season. Mees has accumulated 177 GNC1 points and now leads Springfield winner Bryan Smith by one point. Sammy Halbert is third with 156 points, followed by Harley-Davidson® Screamin’ Eagle® Wrecking Crew rider Kenny Coolbeth Jr., in fourth place with 143 points. Jake Johnson finished third at Springfield on the Harley-Davidson® Screamin’ Eagle Factory Team XR750 motorcycle. Johnson, Mees, Smith and Halbert made up a lead pack that swapped the first position for much of the 25-lap main. Coolbeth, aboard the Zanotti Racing Harley-Davidson XR750 motorcycle, caught the leaders in the closing laps after charging up from a back-row starting position. Johnson passed Mees and Smith to take his first lead of the afternoon as the trio charged through the final two turns of the historic Springfield oval, but Smith used the draft provided by Johnson and Mees to slingshot into the lead and win by just 0.026 seconds. Mees nipped Johnson by 0.001 seconds. The Harley-Davidson Wrecking Crew riders return to the track Sept. 19 for the Roar on the Shore at Delaware International Speedway in Delmar. Harley-Davidson Screamin’ Eagle/Vance & Hines rider Ed Krawiec leaves the Chevrolet Performance U.S. Nationals at Lucas Oil Raceway as the number-one Pro Stock Motorcycle seed for the NHRA Countdown to the Championship playoffs. Krawiec has three wins in six final-round appearances in the first 10 races of the season and leads the Pro Stock Motorcycle class by 135 points. For the upcoming six-race Countdown, points for the Top 10 racers will reset with a 10-point interval between each, plus a 20-point bonus for Krawiec as the top seed. The Countdown playoffs begin Sept. 18 at the NHRA Carolina Nationals in Charlotte, N.C., at the zMax Dragway. Harley-Davidson Screamin’ Eagle/Vance & Hines rider Andrew Hines, the defending Pro Stock Motorcycle champion, is the third seed for the Countdown. Hines has one win in two final-round appearances this season. 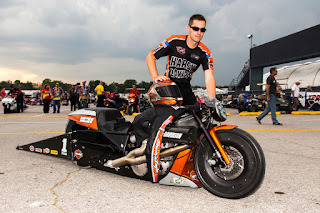 Hines qualified in second position at the U.S. Nationals in Indianapolis, he won in the first round of eliminations on Monday and lost in round two. Krawiec qualified eighth at Indy and also won a single round on Monday. The Love Ride Foundation today announced that Social Distortion have been added to the star-studded lineup headlined by Foo Fighters in a benefit concert to support Wounded Warrior Project. The show will take place outdoors at Castaic Lake, 41 miles North of Los Angeles on Sunday October 18, 2015. 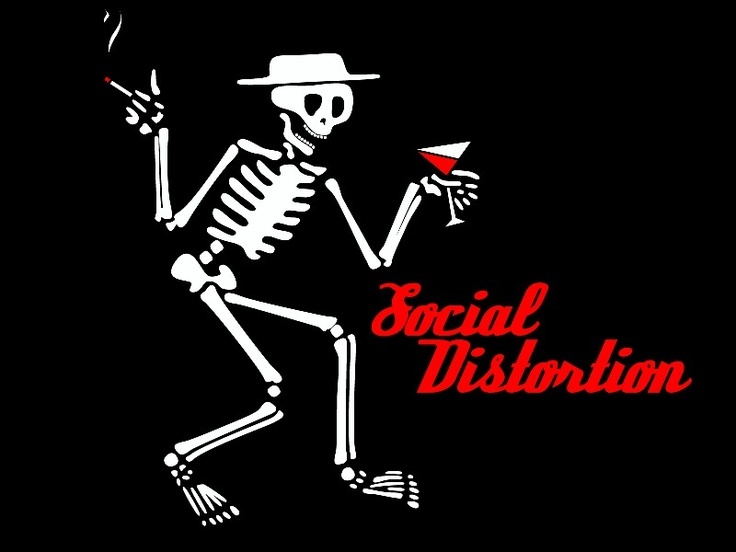 With a career spanning over 30 years, Social Distortion has virtually patented their unique sound, a brand of rock n’ roll that’s cut with rockabilly/punk, blues and outlaw country. Now playing such venerable festivals as Austin City Limits, Coachella, Lollapalooza, Reading and Leeds – their searing guitars and locomotive rhythm section sound more alive today than ever before. With an expected sell-out, Social Distortion fans are encouraged to secure tickets soon. Ride information, registration or concert-only tickets are available exclusively at www.LoveRide.org. Purchase in advance and save $15 off the door. “We’ve wanted to be a part of the Love Ride for years now, so we are stoked that our friends the Foo Fighters asked us to be involved for the final ride; which makes it bitter sweet. The Love Ride festival is the largest and longest-running one day motorcycle charitable fundraising event in the world. Cars are welcome too. Grand Marshall Jay Leno will lead thousands of riders from Harley-Davidson of Glendale, CA, to Lake Castaic. Once there, the concert will take place. Attendees can participate in the ride or show up on site at the lake to enjoy music, a host of surprise musical celebrity guests, custom bike and stunt shows, gourmet food trucks, a vendor exhibition fair and drawings for exclusive motorcycle items and prizes. Keep up with the latest Love Ride news by following @LoveRide on Twitter, Love Ride Glendale HD on Facebook and loverideharley on Instagram. Press Release: Costco Auto Program and Polaris Industries Inc. (NYSE: PII) have teamed up to bring Costco members their biggest joint offer. Starting today, Costco members will receive promotional benefits on a selection of Polaris brands for all model years. Additionally, Costco members save 15 percent (up to $200) on regular-priced parts, service, accessories and apparel year-round, when they present their membership card at participating Polaris powersport dealers. Costco Auto Program has been providing Costco members with great service and value for more than 25 years. It provides a streamlined buying experience to Costco members on automobiles, RVs, motorcycles and powersports year-round, through its network of hand-selected dealerships nationwide. To ensure superior customer service, Costco Auto Program trains and certifies Authorized Dealer Contacts at these dealerships. The program also provides Costco members with online tools to assist with their vehicle search, locate a participating dealer, and make a purchase at a low, prearranged price. Additionally, member advocates are available and prepared to support Costco members throughout their vehicle purchase process. Visit CostcoAuto.com/Polaris or call 1-855-703-2559 to learn more about Costco Auto Program and the Polaris Special Offer. 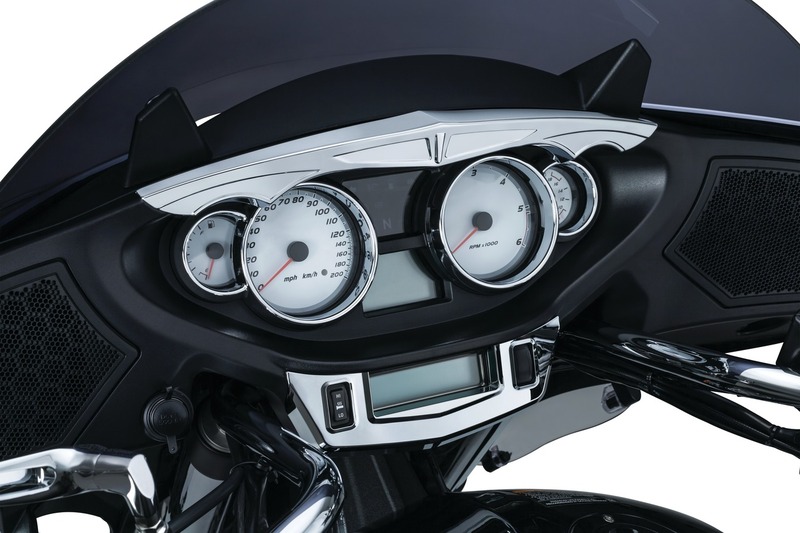 New Product Release: The new Top Dash Accent from Küryakyn provides an instant inner fairing upgrade for Victory Cross Country and Magnum models. 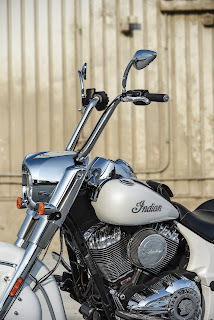 Designed to coordinate with the contours of the OEM gauge bezels, the classic chrome-plated trim transforms the cockpit and also serves as a visor to reduce glare off the gauges. Measuring 16” long x 2-1/2” tall x 1-1/2” deep, the Top Dash Accent features angular styling to match the lines that run from above the stock headlamp housing up through the center of the fairing. 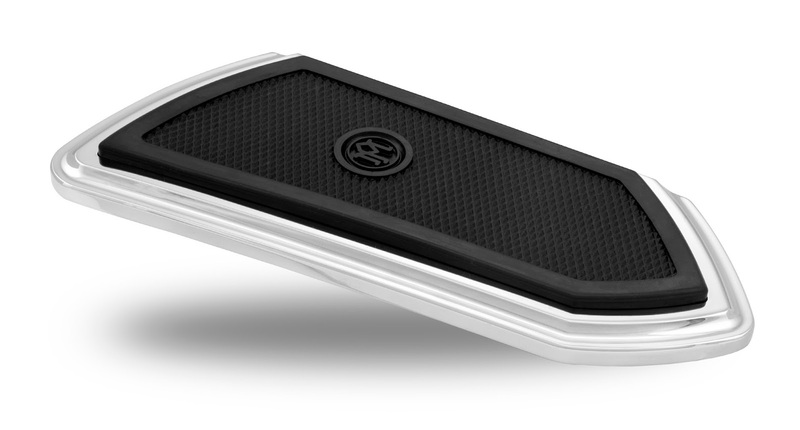 The chrome-plated injection-molded ABS is lightweight, durable and complements the OEM chrome trim around the gauges. 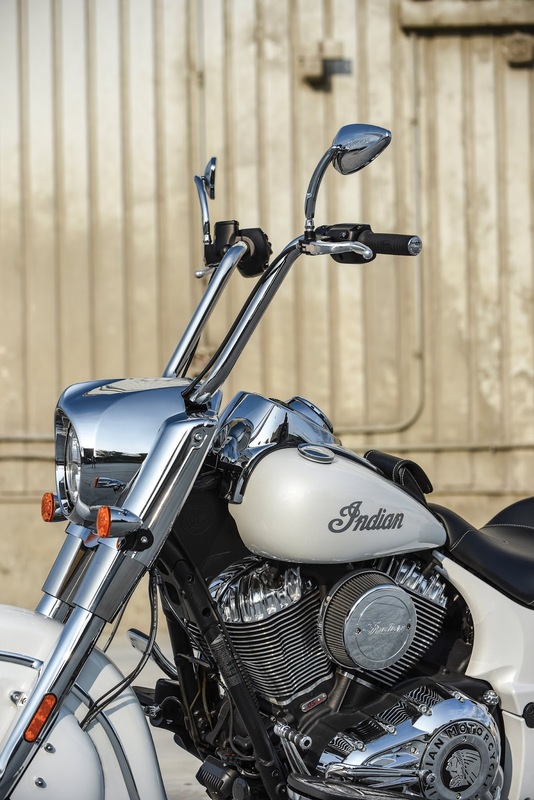 Available in chrome, complete the inner fairing transformation in minutes with everything included for installation on all ’10-later Cross Country and Cross Country Tour, as well as ’15 Magnum and Magnum X-1 models. Big custom baggers deserve big floorboards to support all that BIG attitude. The new PM F.T.Z. rider floorboards lay down a BIG platform for even the largest of riding boots. At 16” in length, there is plenty of foot room on those long rides to stretch out. However, the F.T.Z.’s best feature is the vibration isolating floating tread zone which is neatly hidden in this unique design. 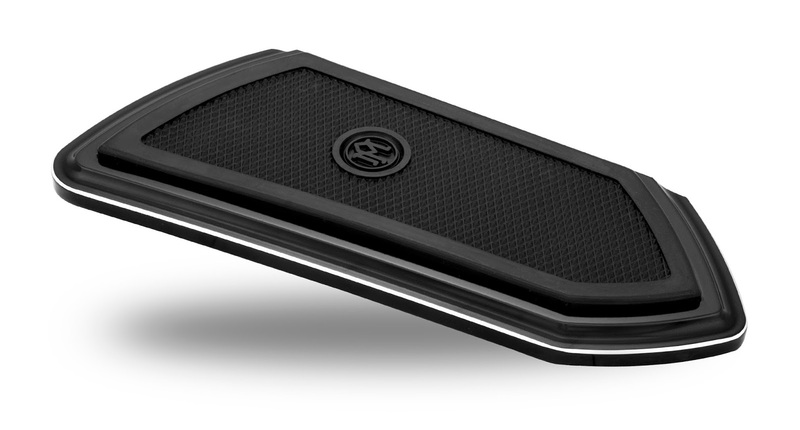 The knurled rubber insert provides a non-slip surface and further reduces vibration. With the F.T.Z. 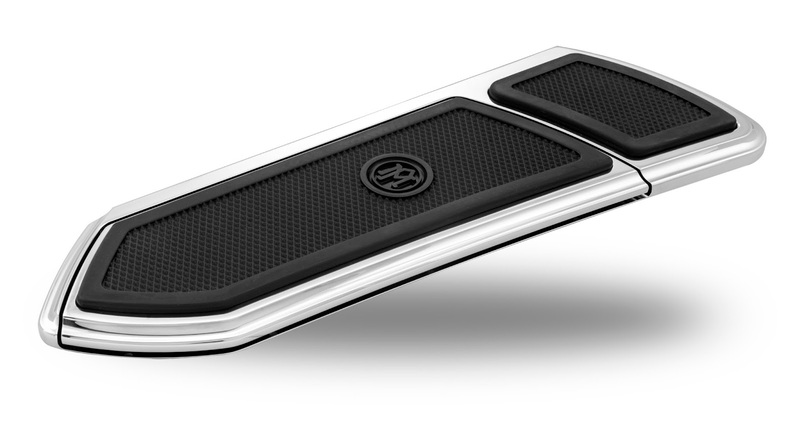 boards you get great PM looks, extended foot room and the vibration dampening of a floating floorboard all in one awesome package. Riding in style and comfort comes standard with the new PM F.T.Z. floorboards. These BIG boards will bolt to stock mounts on 1984-2015 FLH/T touring models and 1984-2015 FLST/FLS models. Matching PM F.T.Z. 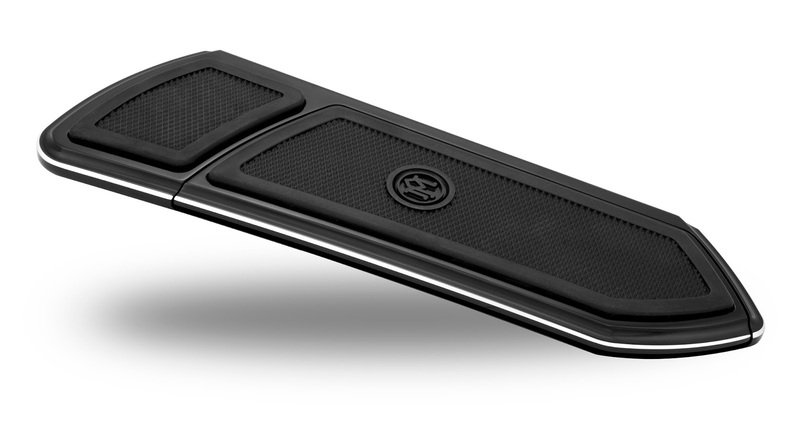 passenger floorboards fit 1993-2015 FLH/T models with stock passenger floorboard mounts. Visit www.performancemachine.com for more information. 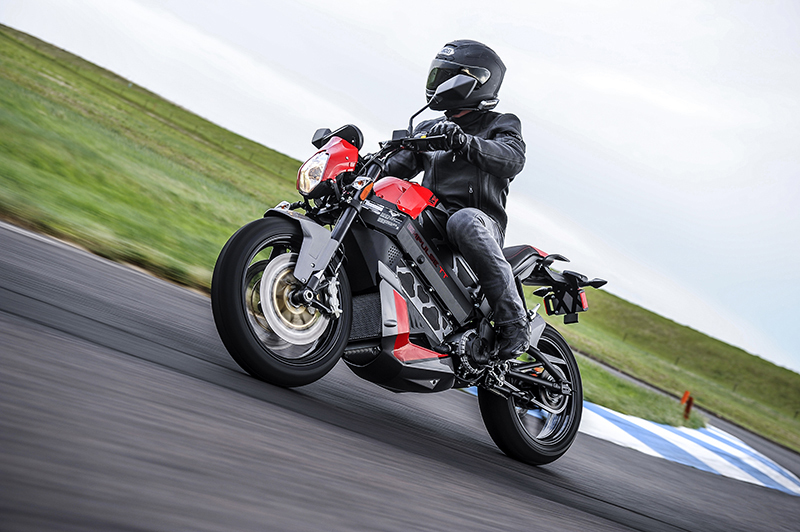 Press Release: Building on the innovative design and engineering that produced the fastest U.S. electric motorcycle at the 2015 Isle of Man TT Zero race, Victory Motorcycles has introduced the 2016 Empulse TT, the first all-electric addition to the Victory lineup. The Victory Empulse TT is a fully electric street-legal sport bike that is as capable of carving tight lines on twisting roads as it is powering the daily commute. Building on Victory Motorcycle’s focus on performance, the Empulse TT features a sport bike-style aluminum beam-frame, an adjustable suspension, and aggressive brakes. 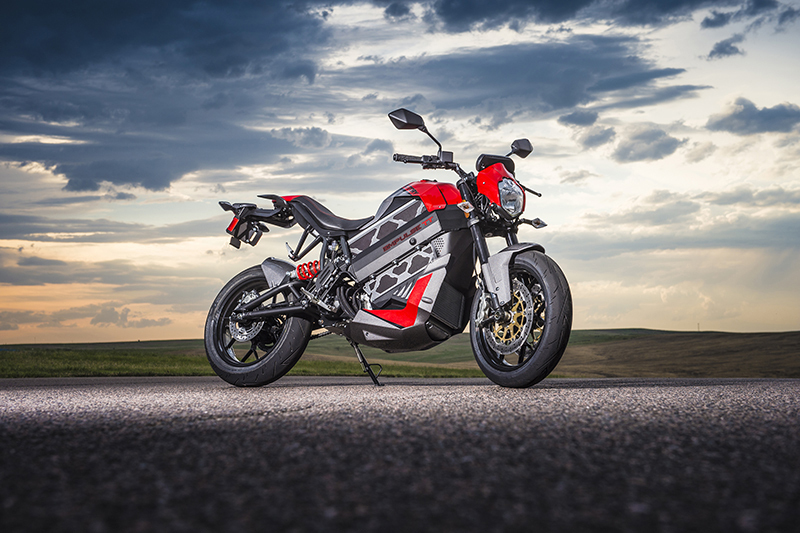 With a combination of advanced technology and stylish, modern design, this unique new motorcycle delivers outstanding overall performance, zero-emission output, and a torquey motor. “We have always been known for great handling and power, so the Empulse TT is an ideal fit in the expanding Victory lineup,” said Motorcycle Product Director Gary Gray. The key features that allow Empulse TT to deliver a sporty riding experience include: a fully adjustable suspension featuring a single rear shock and inverted front forks; dual-disk front brakes that deliver confidence-inspiring high-performance stopping power; lightweight new cast aluminum wheels; the greatest lean angle in the electric class; and a sportbike-style riding position. Steve Menneto, VP Motorcycles, said Victory Motorcycles is committed to expanding brand awareness and sales globally, and the Empulse TT will allow the brand to reach more markets. 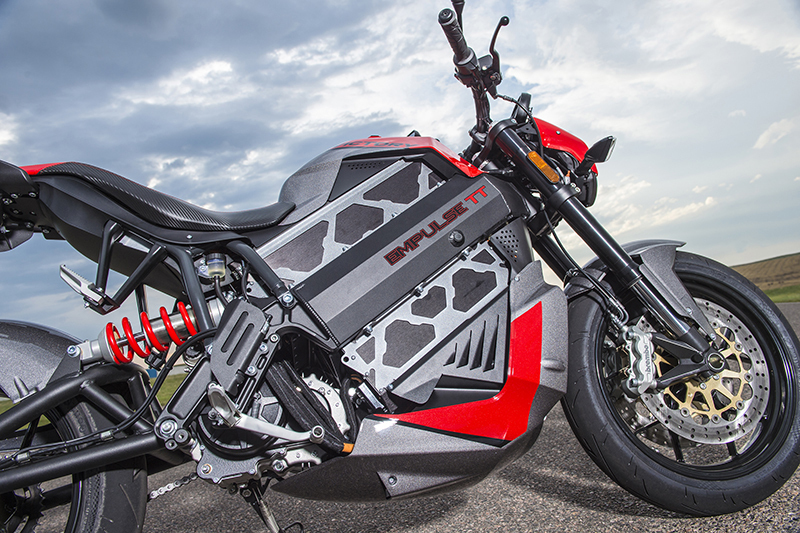 “This is a company that does not fear technology and progressive products, and we want to be strong in the electric motorcycle segment,” he said. The Empulse TT shares some DNA with the original Brammo Empulse R motorcycle. Victory has been working with Brammo since 2011, but in January 2015 Victory’s parent company, Polaris Industries, acquired Brammo’s motorcycle assets. Since then, Victory engineers worked with the Brammo product team to achieve improvements in battery capacity, display function, and handling. The result is a Victory Empulse TT with advanced technology, impressive performance, and sporty styling that draw from the Isle of Man Zero TT race bikes. The Victory Empulse TT is capable of top speeds of over 100 mph, and it has a high-capacity 10.4kWh battery. The bike has a built-in battery charger and an easily accessible SAE J1772 plug atop the bodywork in front of the seat. The bike’s Brammo Power Lithium Ion battery fully charges in just 3.9 hours using a Stage 2 charger (available as an accessory utilizing a 240V outlet). The bike will fully charge in 8.9 hours using a regular household 120V outlet. In typical riding, the Empulse TT battery provides a rider with a range of about 65 miles, and a range of 100 miles is possible with throttle management and use of the bike’s regenerative charging. In preliminary testing, the bike demonstrated a Motorcycle Industry Council (MIC) city range of 94 miles. The bike delivered an MIC “combined 70 mph highway and city range” of 57 miles. Riders can make the most efficient use of the battery’s 10.4kWh of electricity by using the six-speed gearbox. Shifting and downshifting help to create regenerative power (under deceleration), and also produce a feeling familiar to experienced riders of the compression braking on gasoline-powered motorcycles. The rider only needs to use the clutch when shifting between gears, not for taking off or coming to a stop. When coming to a stop, a rider can leave the bike in gear, or choose to click the shifter down (without pulling in the clutch) to put the bike in neutral. To take off from a stop, the rider simply needs to twist the throttle to unleash the liquid-cooled electric motor’s impressive torque. In the Empulse TT’s proprietary transmission, neutral is found between 2nd and 3rd gears, and the transmission can be left in 3rd gear for most riding speeds and conditions. To begin riding, a rider can simply turn the bike’s power on, select 3rd gear (without the clutch), twist the throttle, and go. Not all competitive electric motorcycles have gearboxes, so the Empulse TT gearbox gives the bike a significantly sportier feel, and it enhances a rider’s engagement with the bike. In everyday riding conditions, the Victory Empulse TT can be operated in ECO mode, but it also has an optional SPORT mode for high-performance riding. In SPORT mode, 20 percent more battery power is released to the motor, resulting in enhanced acceleration. SPORT mode also increases the amount of regenerative braking – or “regen” – which further increases the feeling similar to compression braking when the rider rolls off the throttle. Regen uses the inertia of the motorcycle to return energy from the motor back into the battery pack, which increases available energy. To select SPORT mode, a rider presses and holds the start button for 1 second. The bike’s LCD data display features a speedometer, tachometer, gear indicator, and clock. It also displays the battery level as a horizontal bar accompanied by the percentage of battery energy remaining, and provides an estimate of remaining riding range. Genuine Victory Accessories immediately available for the Empulse TT include Victory performance forks, frame sliders, tall and short windscreens, and side bags that hold cargo. The new Victory Empulse TT electric motorcycle is scheduled to be available for purchase in the United States in late 2015. Victory is in the process of determining global demand for the bike before announcing its international sales plan. Press Release: Indian Motorcycle, America’s first motorcycle company, today announced its lineup of Model Year 2016 bikes. 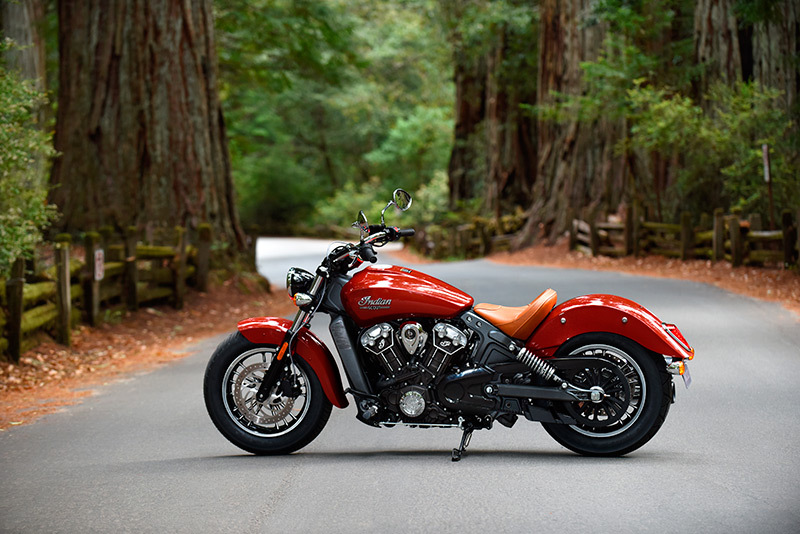 Fresh off of record Q2 sales results and overwhelming demand for both the Indian Scout and the recently introduced 2016 Indian Chief Dark Horse, Indian Motorcycle will rumble into the 75th Annual Sturgis Motorcycle Rally with unstoppable momentum and the industry’s most in-demand lineup. 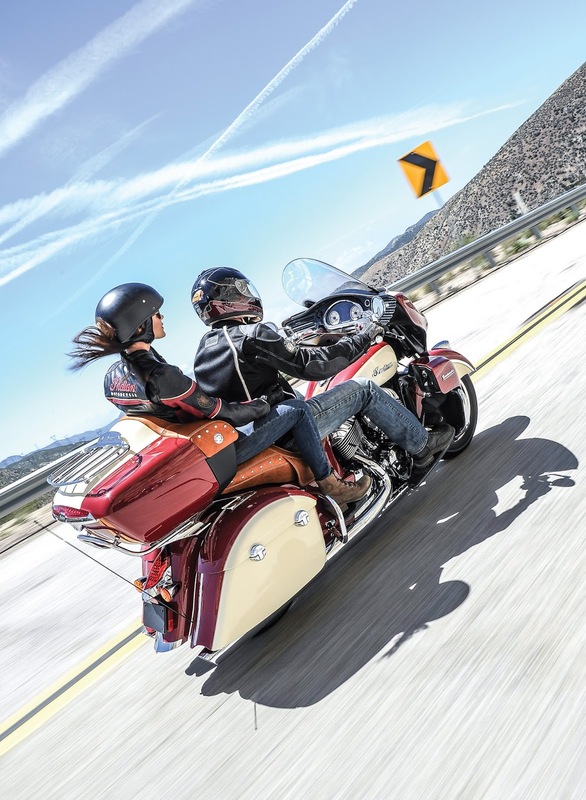 With a growing consumer excitement and increasing dealers on a global level, Indian Motorcycle continues to gain market share and attention. With an unmatched heritage dating back more than 80 years and unprecedented demand for its predecessor, Indian Motorcycle is proud to introduce 2016 Indian Scout ABS. This middle-weight cruiser weighs in at 558 pounds (dry) and extends its decades-long legacy of superb balance, precise handling and potent performance that dominated the Wall of Death and conquered the Bonneville Salt Flats. With its compact design and low 25.3-inch seat height, the Indian Scout is the perfect multipurpose bike for virtually any rider. Featuring a liquid-cooled 69 cubic inch V-twin engine, 100 HP of performance and starting at $10,999 for Gloss Black, and $11,299 for Thunder Black Smoke, Silver Smoke and the striking new Wildfire Red. The new Indian Scout is the proud future of one of motorcycling’s most storied bikes, and is now available with anti-lock brakes (ABS) including the Indian Motorcycle Red paint (itself a $300 premium) for $11,999. All 2016 Indian Scout models come with a genuine leather solo seat, and feature a cast aluminum chassis for superior handling and overall balance. 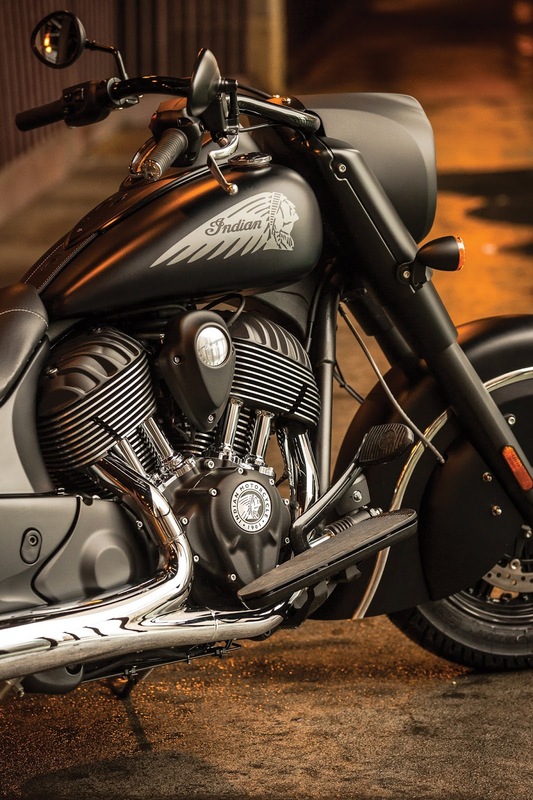 The 2016 Indian Chief Dark Horse is the most striking cruiser on the road. Featuring a matte black finish from end-to-end and only a flash of chrome, this bike makes a statement even before you fire it up. Featuring a low seat height and the lowest price for any Thunder Stroke 111 powered Indian, the Dark Horse starts at just $16,999. 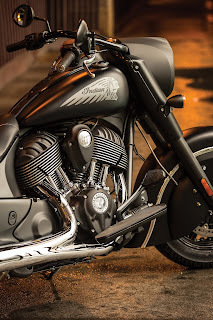 The 2016 Indian Chief Dark Horse delivers the styling, reliability and power expected from an Indian Motorcycle, but with a heathy dose of attitude. 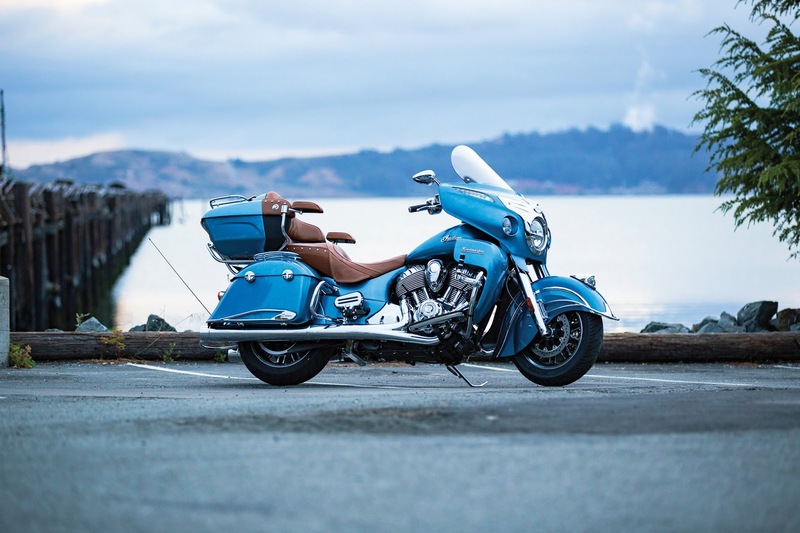 Propelled by 119 ft/lbs of torque and the same chassis and suspension of the award-winning Indian Chief Classic, the Dark Horse™ rolls with standard ABS, a remote key fob for keyless ignition, electronic cruise control, and features a two-year unlimited mileage factory warranty. New for 2016 the Indian Roadmaster is available with new color options that include Blue Diamond plus two-tone Storm Gray & Thunder Black and Springfield Blue and Cream. In 1938 Indian Motorcycle dealer Clarence “Pappy” Hoel and the Jackpine Gypsies Motorcycle Club started the Black Hills Motorcycle Rally never knowing that it would grow into the World’s biggest motorcycle rally. 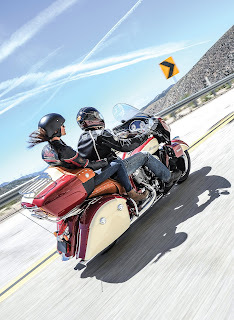 For the diamond anniversary, starting Friday July 31st, Sturgis attendees are invited to experience these the new line-up at the Indian Motorcycle factory display on Lazelle St. through the rally, or to experience them firsthand with a factory demo ride at 2100 Whitewood Service Road (I-90 at Exit 30) from Saturday, August 1 – Saturday, August 8, starting at 9 a.m. – 5 p.m. daily. In addition to stock motorcycles, accessorized units will be on hand to experience comfort and performance items.